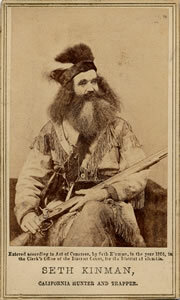 Legendary Humboldt County trapper Seth Kinman captured grizzlies and fashioned them into articulated chairs. "This was intended to surpass all his previous efforts, and was made from two grizzly bears captured by Seth. The four legs and claws were those of a huge grizzly and the back and sides ornamented with immense claws. 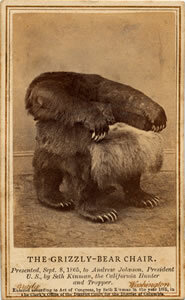 The seat was soft and exceedingly comfortable, but the great feature of the chair was that, by touching a cord, the head of the monster grizzly bear with jaws extended , would dart out in front from under the seat, snapping and gnashing its teeth as natural as life. This chair Seth presented to [President] Johnson, September 8, 1865."